Newcastle chairman Freddy Shepherd insists he will not be rushed into appointing Graeme Souness's successor. Shepherd will take his time to line up a replacement for the sacked Scot and said: "We've already had a lot of top names applying for the job. "The board won't be hurried. We have to get the appointment right. We'll take our time. We had to act because we have to start winning again." Caretaker duo Glenn Roeder and Alan Shearer have ruled themselves out. Martin O'Neill, Sven-Goran Eriksson and Sam Allardyce have been linked with the job. But Shepherd will be patient before appointing another new manager in his reign as chairman. He said: "Glenn Roeder and Alan Shearer are quite capable of getting us through to the end of the season. "I have great faith in two people who are black-and-white through and through. "There are 15 Premier League matches left plus the FA Cup ties so there is plenty of football to be played and we have to get an upturn in fortunes." And Shepherd insists there will be no shortage of candidates for a job that has come to be regarded as a poisoned chalice. He said: "Of course people want the job. It's one of the biggest in world football, so why shouldn't they? "But we don't want to be rushed into giving it to the wrong man and we'll take our time and be very careful. There is no need to hurry. "We have no preconceived ideas, no one is lined up." 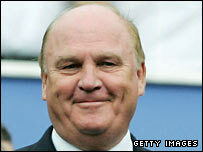 Shearer, 35, will assist Roeder in the short term, but does not plan to apply for the top job. "Let me say here and now that I do not want to be the next manager, the time is not right for me or the club," he told The Sun newspaper. "Things are set up for someone to do well. I hope that someone is the next manager. I just know it will not be me. "That is not meant as a slight on the club. I am just thinking of what is best for Newcastle United and, right now, it would not be the best thing to have Alan Shearer as manager. "I have stood up and said that to the players and Glenn has ruled himself out of being the permanent boss too." What went wrong for Souness?